Mango Deluxe Foraging Tree is the ultimate manzanita playstand ... new, innovative and very exciting. 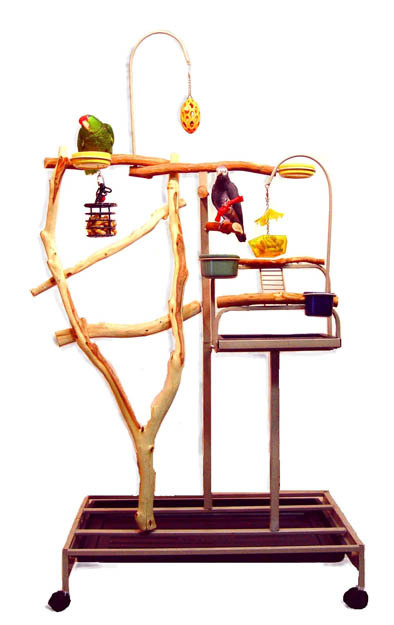 A playgym any parrot will love! 5 feeding stations and plastic crocks to keep any bird occupied. There is even an extra foraging spot on the tray! Crock color will be chosen by the warehouse personnel based on availability at time of shipment. Lifetime limited warranty on workmanship. 5-year warranty on powder-coat. SHIPPING INFORMATION. This foraging tree playstand requires a shipping quote to be obtained for your approval. This quote reflects the actual shipping company’s charges for delivery to your city/zip code location. We have chosen to offer our manzanita playstands in this manner to provide the lowest prices and fairest shipping costs for your purchase. We request the lowest shipping quote available to your location. A shipping quote can be obtained before or after submitting your order. Before order submission please contact us at customerservice@birdcageportal.com or you will be contacted with the quote information after your order is received and prior to processing.